We all want to hit the ball longer. The question is how? For awhile there have one plane and two plane swings. Today we’ll show you how the hybrid swing plane will help you hit the ball longer. A big tenant of the one plane golf swing is to return the golf club back to the same position it was (in terms of the shaft plane line) at address. That’s what Moe Norman and Ben Hogan did. But let’s see how some of the top golfers in the last 10 years fare as far as that is concerned. 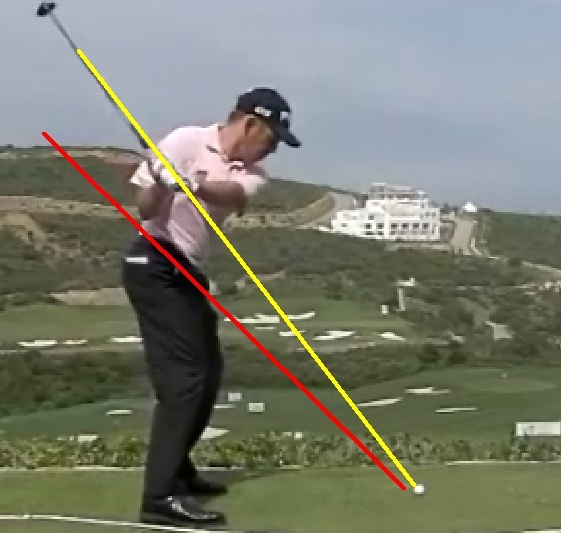 So 9 of the top 10 golfers in the world over the last 10 years DO NOT return the clubface to the same plane line that they started at at address (Steve Stricker does). Why did I show you that? Because I believe the plane line should be more vertical than a one plane swing, and not as vertical as a two plane swing. Somewhere in the middle. A great model I’m going to show you in a minute for this, is Louis Oosthuizen. But these impact pictures begs the question… are they trying to do that? The forces are so great at impact that the hands are being pulled up. That’s just a natural occurrence of the modern, powerful golf swing. So that got me thinking how it would be good to swing on a plane that is similar to what happens at impact. Because you can talk all you want about one plane and two plane swings (in terms of the backswing and shoulder plane, left arm angle etc.). But at the end of the day, it’s what happens at impact that matters. So my Hybrid Golf Swing Plane theory, is to swing back so that at the half-way point in the golf swing the club shaft points down at the ball. Then at the half-way point in the downswing, the club shaft again points at the ball. I’m now going to show you this theory in action in one of the best swings on the planet. Louis Oosthuizen is the 2010 Open Champion and has a golf swing that many believe is one of the best among professional golfers. So let’s put my swing plane theory to the test, and I’m going to draw a line through his setup at address right through the middle of his back. Pretty damn good swing, with a very consistent swing plane! And if you split the difference between those extremes you get 24 degrees. 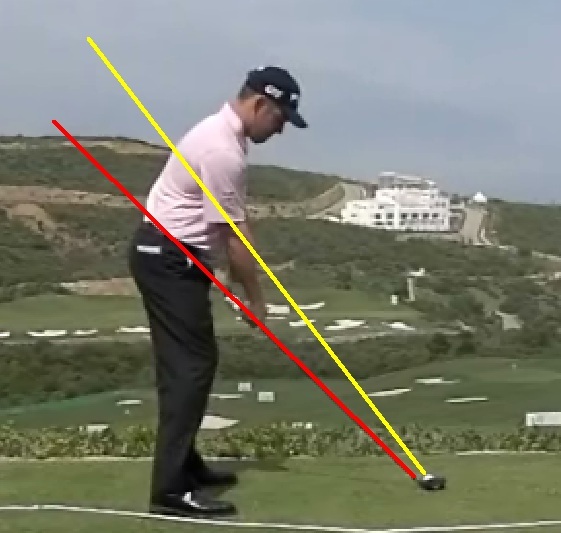 Louis Oosthuizen at 22 Degrees Difference is almost bang in the middle. And this swing plane that Louis uses is what I term “The Hybrid Swing Plane”. I have a swing plane program in which I’m going to teach you how to groove a consistent golf swing plane like this… so watch out for an email about that program soon. Having a consistent golf swing plane will help you to hit straighter, longer and more consistent golf shots. So if you lack consistency in your ball striking, working on making your golf swing plane more consistent can only aid you in improving your ball striking consistency. I hope this series I’ve given you on the swing plane has clarified a lot of issues you had with understanding the swing plane. And I hope that now you have a very clear idea on what swing plane you should be swinging back, down and through on. 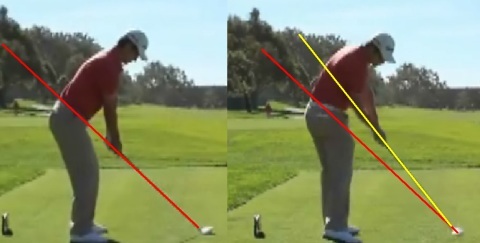 The differences between a one plane swing and a two plane swing are quite obvious… when you know what to look for. So let’s start this discussion off with a look at the one plane golf swing. Two of the most famous one plane swingers were Ben Hogan and Moe Norman. Moe Norman is more extreme than Ben Hogan, so we’ll look at him first. As you’ll notice… Moe’s hands are very high and his club is set back a foot or so from the ball. Now the key to a one plane swing, is to keep the club shaft parallel to the line that is created at setup. Then the goal is to get the club shaft back onto the same plane line that was created at setup once you reach impact. 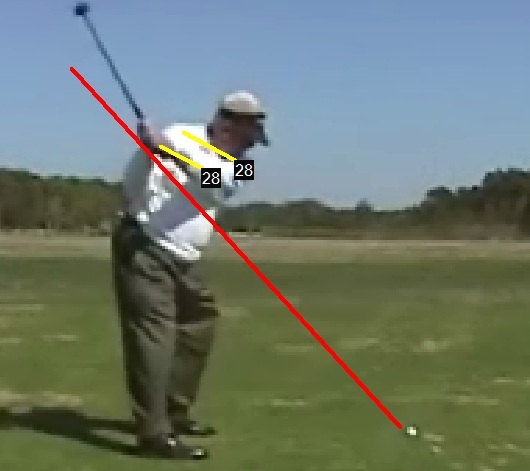 I will show you some images from a video of Moe Norman doing this. 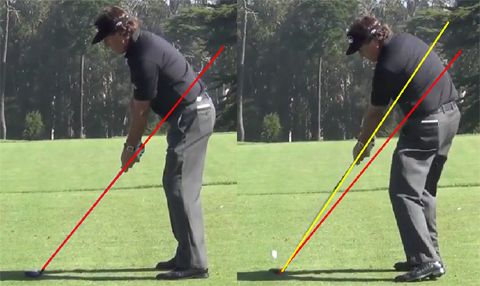 At crucial parts in the swing Moe’s clubshaft is parallel with the shaft line that he started with at setup. Moe has a pretty unusual looking swing though. I don’t know who came up with the term ‘Natural Golf’ but that doesn’t look too natural to me! So let’s look at the more “normal” setup and swing of golf legend, Ben Hogan. 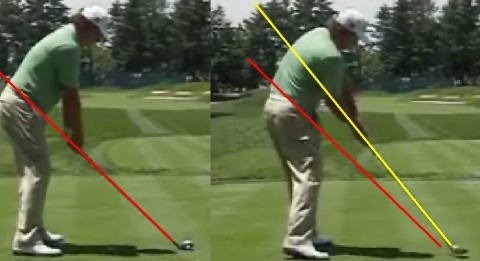 So that’s a look at a couple of famous one plane swings. There is a measurement you can use to help determine if a golfer has a one plane or two plane swing. I’ll give that to you later in this article. But before we move onto two plane swings, I just want to make a very important point about one plane swings. Now here is an extreme opposite of Moe Norman. Jim Furyk and his two plane golf swing. Wow… Jim’s got a lot going on with his swing plane! But he’s a great golfer who proves you can play great golf with a two plane swing, just like you can with a one plane swing. My personal opinion, based on the golfers that are great with the one plane swing, is you need to hit a lot of balls for it to work. If you don’t want to be a range rat, then a two plane swing or hybrid swing plane is what you should be looking to do. In my next article I’m going to be talking about a hybrid swing plane, because I believe that’s the way to go – and I’ll explain why in my next article. Before I leave you however, I just want to point out an easy way to measure whether a swing is a one plane swing or a two plane swing. Because at the half way point in the backswing and downswing, a person can have what looks like a one plane swing and yet be a two plane golf swing. You can measure this yourself (for your own swing) if you have a video and some golf swing video analysis software. So hopefully now you have a clear understanding of the main differences between a one plane swing and a two plane swing. As I’ve already said, I don’t think any extreme version is right. I would never teach a person to swing like Moe Norman. Equally, I would never teach a person to swing like Jim Furyk. I like the middle ground and both swing plane theories have their good points that I think can be melded into a great golf swing. So in my next article I’m going to show you a great Major winning golf swing that puts my theory into practice. Until next time, have a great week. And now you know what to look for if you’re analyzing your own swing plane, to tell whether it’s a two plane or one plane golf swing. What Is The Swing Plane? Today I have something new and exciting for you. Over the next few weeks I’m going to be giving you some great information about the swing plane, from a man named Jeff Richmond. As you’re no doubt aware, the swing plane is so important in terms of distance, direction and consistency. And if you get the swing plane correct, you will have way more chance of hitting good shots consistently. So in today’s first installment on the swing plane, Jeff is going to get everyone on the same page by explaining exactly what the swing plane is. And once he’s done that, he will then move into some more detailed aspects of the swing plane, and what you need to do to have a consistently good swing plane. When you start looking at the swing plane you can get confused – FAST! It’s an area where the more scientific/engineer types seem to have a field day. And if you’re not that way inclined you can read and watch some stuff on the swing plane that will just give you a headache! In today’s article, I’m going to try to keep this nice and simple so we can all be on the same page for the rest of this swing plane series. Now, the swing plane first became popular thanks to Ben Hogan and his image of a pane of glass. When Ben Hogan was talking about the swing plane in terms of the pane of glass, he wanted the the left arm, hands, club etc. to stay below that pane of glass on the backswing and downswing. But when Ben Hogan’s famous five lessons book was published in 1957, they didn’t have the technology like we do today to dissect the golf swing to the nth degree. And so the concepts of the swing plane have evolved a lot from the simple illustration that Ben Hogan gave us. So what is the golf swing plane? Well, the golf swing plane is an imaginary flat service that is used to determine what path certain parts of the body and club are traveling on throughout the golf swing. This may sound stupid, but it has to be said…. the golf club cannot move itself. 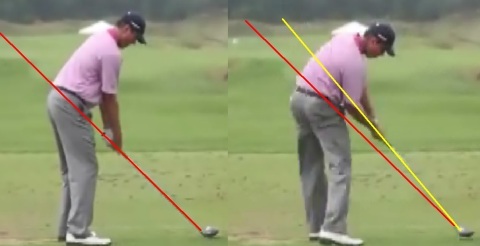 A lot of times when people look at the swing plane they only look at the shaft. 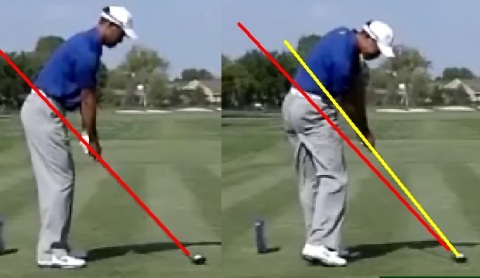 But the shaft is only moving as a result of the body movements. 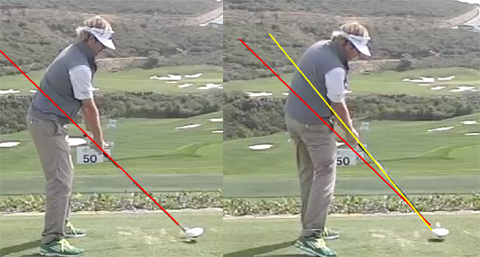 So you need to look very carefully at the plane your body is moving on when looking at swing plane. It’s important to note that I said above “certain parts of the body and club”, because when you swing your shoulders move on a plane. Your elbows move on a plane. Your hands move on a plane, your club moves on a plane etc, etc. That’s why if you see someone analyzing a golf swing, they’ll draw a lot of lines to try to analyze what plane different parts of the body and club are moving on. When you swing you’re obviously swinging in a circular pattern. And because you’re bent over when swinging your swing plane is tilted. 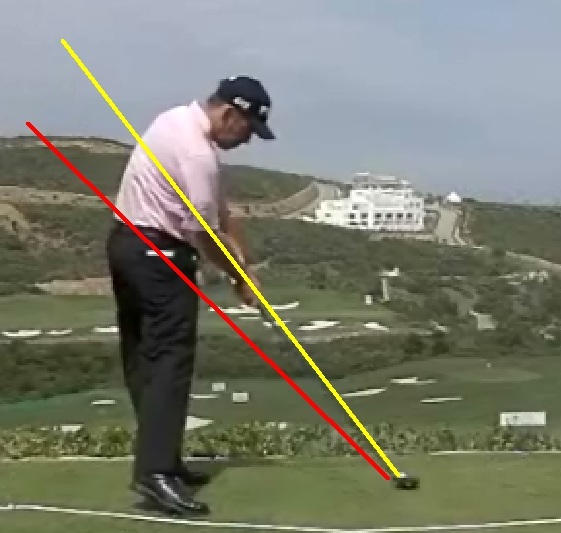 How much it is tilted depends on the player’s height, how they stand to the ball, the club being used etc. etc. There’s a number of different variables. So everyone will not have the same swing plane because of this. And so there’s no one exact swing plane for everyone. When I say that, I’m talking about absolute degrees of swing plane. But there are good reference points every golfer can use, and I’m going to discuss these in this swing plane educational series. When you hear about swing plane you often hear people saying that “so and so” has a flat swing plane, or this golfer has a steep swing plane. When people say that, what are they referring too? Most of the time they are referring to the shaft angle. And a good checkpoint is halfway into the backswing. 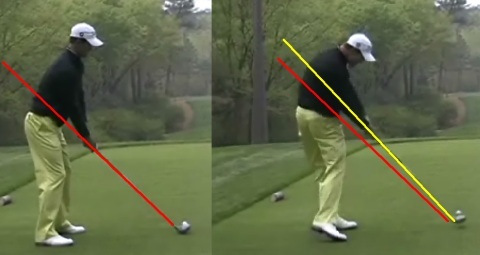 A famous golf pro who is said to have a flat swing plane is Zach Johnson. Here is a picture of Zach at the half-way point in his golf swing. Zach uses a one plane swing to hit the golf ball. So anyone that is a fan of the one plane golf swing will not say that Zach’s swing is flat. They’ll say it’s on plane. That’s where golf instructors get into arguments. In the next email I’m going to talk more about the one plane swing, two plane swing etc. But for now, notice that at the half way point in his backswing the club shaft is pointing out side the ball. 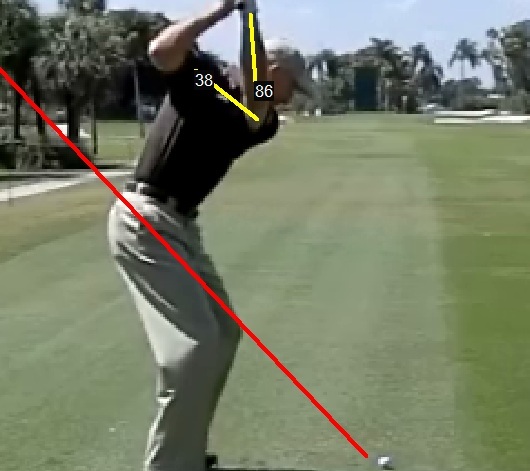 Now compare that to probably the most extreme case of a two plane swing, and that is Jim Furyk. Look where the shaft is pointing at the half way point in his backswing. So the swing plane is a combination of the movement (arc) of the shoulders, arms, hands and club predominantly. And this is measured and analyzed with straight lines… so it’s 2d. I have seen 3d swing plane software and analysis, but for this swing plane series I’m not even going there! I hope that’s a simple explanation and everyone is on the same page. If not, don’t worry because over this swing plane series, you should hopefully get a much better understanding of it and what you should be trying to do with your swing plane. 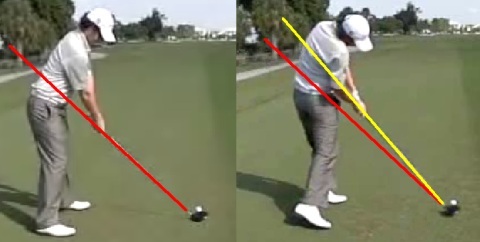 In the next email I’m going to be looking at the different types of swing planes, e.g. the one swing plane swing, the two swing plane swing etc. I will be giving you examples of each type of player, so hopefully you should find that interesting and informative. How Long Does 18 Holes of Golf Take? If you’re new to the game, you might be wondering how long does 18 holes of golf take? This could be for two reasons: 1) you want to know what to expect or 2) you just spent 5 hours chasing the ball around and you want to know if that’s normal. The average is about 4 hours. That being said, the amount of time it takes to play the game of golf will vary based on the player but there are some average times that you can go off of. The time will vary based on your shot and the number of people you are playing with. Golf courses have studied how long the players spend on the golf course over a two year period. After this time they took the average and it is possible to finish this course is four hours. How Long Does it Take to Play One Hole of Golf? There is an average of just over 15 minutes spend on each hole. This includes the amount of time that you spend walking or riding from one hole to the next. If you are a fan of golf you will know that not one golf course is like the other. The time it takes to play the game will be greatly affected by the difficulty level of the course. For example if you plan on a course with par 3 and par 4 holes then you can expect four hours of playing time. If the course has par 5 holes then it is going to take less time. The number of people partaking in the golf game will also affect the time. A pair that is golfing will be quicker than a group of four. The addition of two people to the game can add another hour to play an 18 hole course. There you have it, the average time that you will spend on an 18 hole golf course. But don’t watch the clock, just get out there and enjoy the game!